So are you an admin to a Facebook Fan Page? If so, have you noticed the new spam filtering options on your wall updates? Facebook just released a new spam control option for page admins that allows you to have more control over the content that is posted on your Facebook Page wall. This new spam option is viewable only to page admins, and simply allows you to quickly mark any wall update as “spam”. 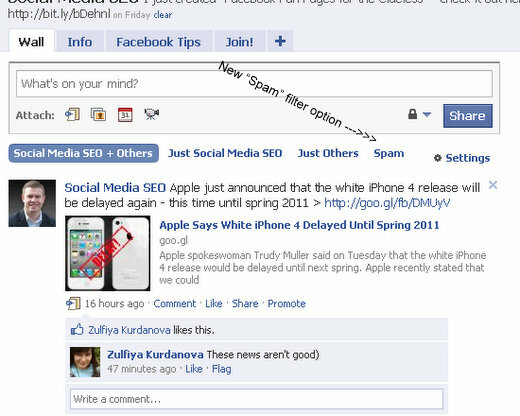 And this newly marked spam update will be added to a new section on your Fan Page wall called “Spam”. Facebook’s spam filters will also automatically add content they think is spam to this “Spam” tab. And all you need to do is visit the “Spam” tab to view all of the messages, and unmark as spam those updates that you feel are not spam. This new spam option for Facebook Fan Page admins may not seem like big deal, but it really is. It allows admins to keep their pages free from unwanted messages, helps teach Facebook spam filters what is and isn’t acceptable, and allows page admins to build a substantially higher quality Facebook Fan Page. 1) Click the “settings” link in the top right of your Fan Page updates – it’s the small text link in the upper right hand corner in your wall updates. Let us know if you find this new spam filtering valuable to you and your Facebook Fan Page. But i have a question: I´ve a fanpage and i´d prefer not having the spam tab. I prefer see all the post in the main wall. Is it possible?